The lawsuit against McKesson, Cardinal Health and AmerisourceBergen Drug — the largest opioid distributors in Washington — is Ferguson’s second related to an epidemic he said has killed more than 8,000 state residents. In 2017, the attorney general filed suit against opioid manufacturer Purdue Pharma. That suit is scheduled for trial in September. “We’ve seen the data and it is shocking,” Ferguson said at a Tuesday news conference announcing the latest suit. Standing with him were supporters, including two women whose sons died from opioid overdoses, and Quinault Indian Nation President Fawn Sharp, who said tribal rates of drug and alcohol addiction were twice the national average. Ferguson said he couldn’t disclose some confidential information about the distributors. But his 58-page complaint said the state had access to data showing the three companies, combined, shipped at least 269,000 suspicious orders into Washington between 2006 and 2014. Orders are deemed suspicious when they deviate from standard patterns — for instance when a pharmacy begins ordering several times the amount it used to, or far more frequently. Distributors are legally obliged to stop such shipments, and report the orders to the Drug Enforcement Administration (DEA). By not doing so, Ferguson’s lawsuit charges, the companies violated Washington’s Consumer Protection Act and engaged in negligence. The distributors sent so many opioids into the state that, at various times, prescriptions in 16 counties outnumbered the population. Grays Harbor County, for instance, in 2015 got nearly 120 prescriptions for every 100 people among its population of roughly 73,000. Asotin got roughly 147 for every 100 people that year. Other counties falling into that camp are Snohomish, Clallam, Skagit, Chelan, Okanagan, Pend Oreille, Spokane, Grant, Columbia, Benton, Cowlitz, Wahkiakum, Lewis and Pacific. This, despite civil penalties, settlement payouts and, in AmerisourceBergen’s case, loss of the right to ship opioids from one distribution center, all due to allegations of improper practices across the country. 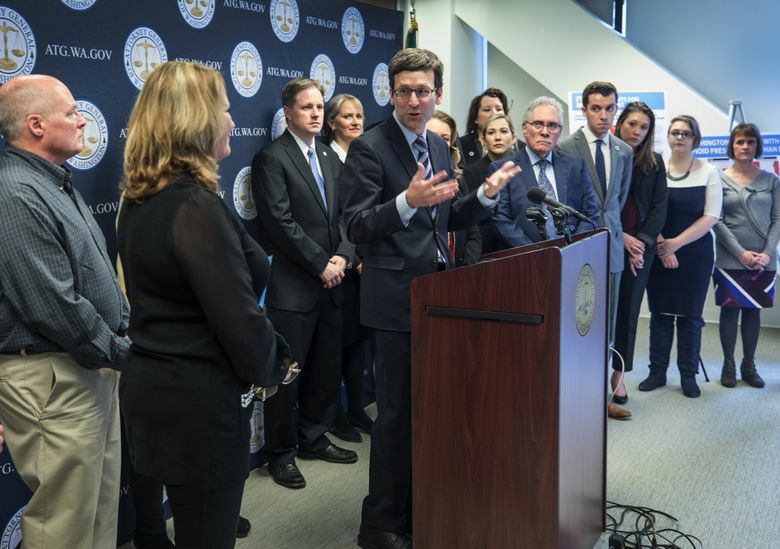 Assistant Attorney General Jeff Rupert said he believes Washington to be the 10th state to have filed suit against at least one opioid distributor. A McKesson spokeswoman said the company did not have a specific comment about Ferguson’s suit. But she forwarded a general statement. The company only distributes opioids to DEA-registered and state-licensed facilities, the statement goes on, which also adds that McKesson has contributed $100 million to a foundation fighting the opioid epidemic. Cardinal Health and AmerisourceBergen did not immediately respond to requests for comment about Ferguson’s lawsuit. On their websites, both say they are also fighting the epidemic by giving money and devising strategies with other organizations. Lawsuits against opioid distributors and manufacturers are complex and challenging, Ferguson said. These multimillion-dollar companies are well-equipped to fight back. He said he was committed to pursuing them to hold companies accountable and win money that could be used for treatment. His suit against the distributors, like the one against manufacturers, asks that the companies surrender profits made in Washington. Lately, some have suggested that governments might be going too far in their efforts to stem opioid misuse. A December report by Human Rights Watch, based on interviews with patients and doctors in Washington and Tennessee, said a chilling effect was preventing a number of chronic-pain patients from getting the medication they need.